Robes with long, flowing sleeves called furisode—a Japanese word that literally means “fluttering sleeves”—were worn by young, unmarried women. 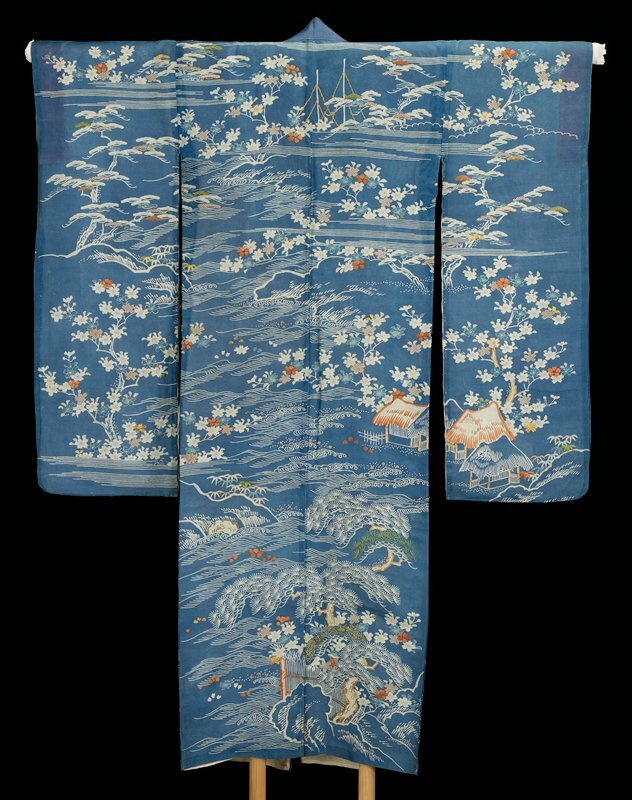 The silk of this furisode was dyed light blue overall, but portions of the silk were left undyed to create the pictorial design. The artist further enhanced this by adding embroidery in green, orange, and gold thread. The overall design is of a fishing village in spring, its seashore lined by pine trees and cherry trees in full bloom. Similar to many Japanese painted landscapes, we “enter” the village at the right lower back of the robe via a path edged by a brushwood fence. Just below the waist of the robe we see a row of four thatch-roofed homes that extends to the right sleeve, and farther up, at the top of the center section of the robe, we see two fishing nets, one green and one gold.